Homer Bailey is looking good so far. Not no-hitter good, but you want to save those for the regular season anyway. 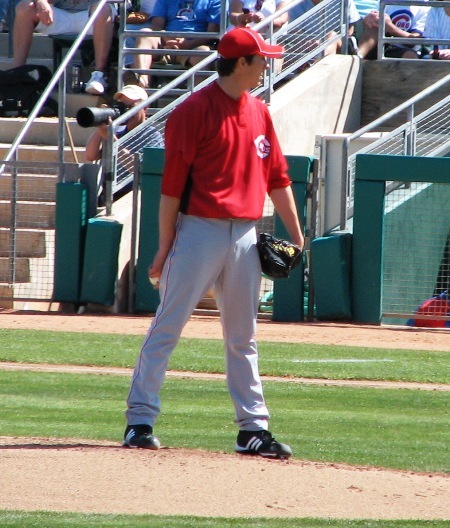 Homer Bailey took his turn on the mound yesterday against Kansas City and put in 2 scoreless innings. He struck out 5 and allowed only 1 hit. Unfortunately for him, the Royals are on a tirade this spring and went to town on Tony Cingrani (1 ER), Logan Ondrusek (1 ER), Jose Arredondo (1 ER), Pedro Villarreal (1 ER), and especially Kyle Lotzkar (4 ER). The Reds’ 8-1 loss to the Royals is par for the course this spring, as the Royals have yet to lose a spring training game. Kansas City fans should definitely get their hopes up because this is the year. The Reds’ 1 run came in the eighth inning. Kristopher Negron doubled to lead off the inning and, two outs later, Ryan LaMarre doubled him in. Alas, that was all there way of the rally. Today the Reds head to beautiful Salt River Fields in Scottsdale to take on the Diamondbacks. Johnny Cueto will start for the Reds against Brandon McCarthy for Arizona. First pitch at 3:10 p.m. and you can hear it on MLB.com if you’re willing to pay for it. The All-Star Game is coming to Cincinnati in 2015, and Hamilton county is trying to get passenger rail service in place in time for the game. According to this story on KYPost.com, the Transportation Improvement District has approved the resolution. I, myself, live in an area that is debating more public transit, so I know how contentious it can be (though the arguments do tend toward dummies saying that government shouldn’t start subsidizing certain forms of transportation, without apparently realizing that governments already build roads). But I also regularly visit Cincinnati, so I also know how difficult it is to get around if you’re not driving. It would be great if the All-Star Game was the impetus to make the city that much of a better of a place. For just $4, you can finally satisfy that baseball longing that’s been building up all off-season and be the most knowledgeable person talking Reds at the water cooler.